Greetings from Goodness Grows! We would like to thank everyone who came out to the Community Sponsored Agriculture (CSA) Farm Tour that took place Sunday. The farm tour went off without a hitch and allowed some of our newest members to see the sustainable techniques that we at Goodness Grows pride ourselves on. Participants were treated to a variety of delicious cookies made with fresh ingredients from our farm, greenhouse grown salad with a choice of yogurt chive dressing or strawberry mint walnut dressing made by Dawn and deviled eggs prepared with our own free range chicken eggs — making the farm tour not only informative but tasty as well. This year we split the tour into five sections manned by our boys (Caleb, Silas and Levi) and the four WWOOFers (World Wide Opportunities in Organic Farming) we currently have working and staying with us (Eleanor, Griff, Brittany and Greg). Each section of the tour highlighted a certain aspect of what it is we do at Goodness Grows. 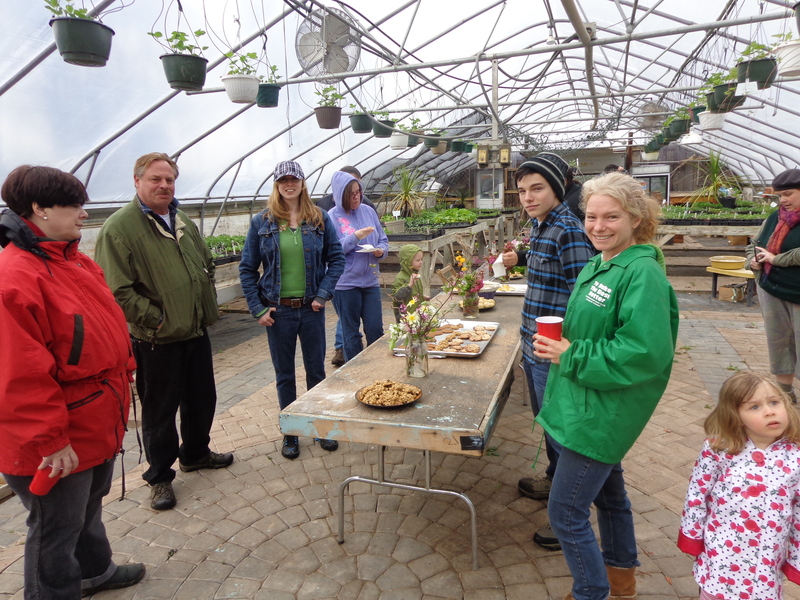 Starting with a walk through our greenhouse, participants were able to experience the inner workings of how we transplant and package the many varieties of organic vegetables and plants that we have. 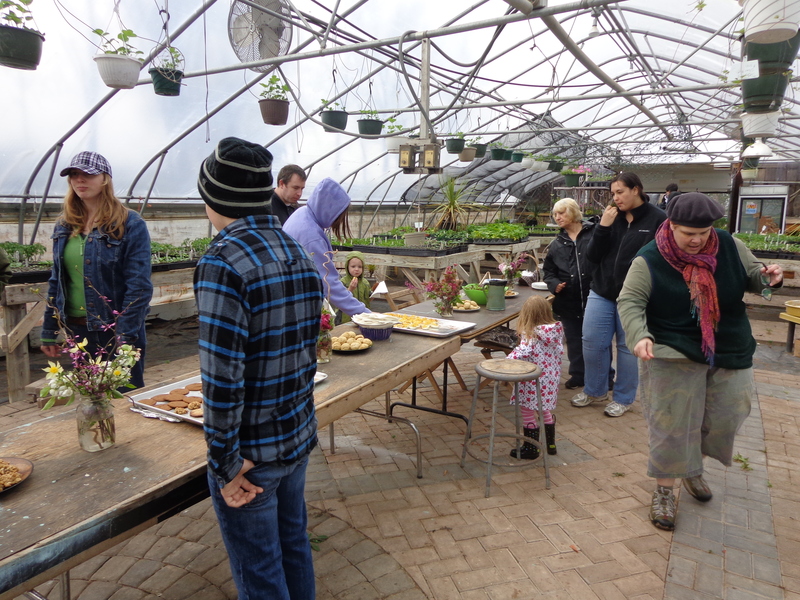 This experience was followed by a visit to our cold frames and an introduction to “Bernie”, our furnace which heats the water for our house and has been modified to flow to the greenhouse where the water is naturally heated by the sun. Participants were also given a short history of the old forge which dates back to the mid to late 1800s that is located on site. From there the tour continued with a stop at the main house where participants were able to see the extensive renovations that we have been working on (primarily the work that Rob has done on the downstairs kitchen). After that each group was brought to our barn where they learned about our goats, sheep, pigs and free range chickens. This part of the tour was especially exciting for the younger children in attendance. The tour concluded with a brief history of the old stagecoach drop located on the farm and an extensive detailing of our composting techniques, our chicken tractor and our plans for a high tunnel in which we plan to plant raspberries. All in all, we feel that all participants were privy to a better understanding of what Goodness Grows truly strives for in a fun and relaxing atmosphere. Despite the rainy, overcast conditions it is our belief that all those who participated learned a lot and had a great time. Once again we would like to thank all of those who participated, our old and new members alike, and hope that future farm tours at Goodness Grows can be as fantastic as this years. Madeleine and I had a wonderful time on Sunday. She is still talking about the chickens and ginger snap cookies. Thank you for taking the time to educate us on the operation of your organization. It makes me feel so good to be supporting folks like you who are doing such wonderful work for our environment, our community, and our bellies! After visiting with you all, I’m now even more excited to start receiving my weekly share and coming up with yummy new recipes to feed my family. I’m sad I wasn’t able to make it out for the tour! I’m so looking forward to our CSA share this year and can’t wait for it to start!